The TUFF-Pad range of excavator rubber pads are available for steel tracked diggers from 3-30 tons. At Mainline Track, we supply direct from the factory, quality and wear resistant excavator rubber pads to cater for every machine. 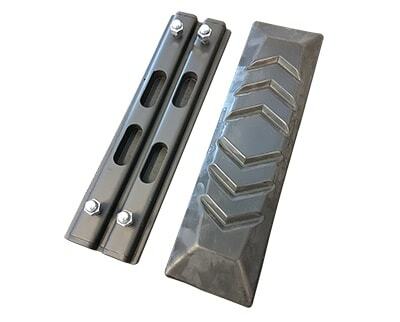 These rubber pads feature the most versatile designs, moulded exclusively from top quality materials. The option of fitting Rubber Pads to your steel tracked excavator is the perfect solution for using existing equipment on finished roads and surfaces without damage, thus enhancing the contract opportunities open to you. Our pads are stocked in 3 different designs in order to ensure we have a product to match every steel tracked digger including Case, CAT, Daewoo/Doosan, Kobelco, Komatsu, Kubota, Hitachi, Hyundai, IHI, JCB, Komatsu, Sumitomo, Takauchi, Yanmar and Volvo. Our TUFF® rubber pads have the highest natural rubber content in rubber pads found in New Zealand, and also offer 25% increased longevity over Chinese equivalents! This is backed by New Zealands most extensive warranty given on a rubber pad. Bolt on pads are very popular for excavators which have bolt holes pre-drilled in the steel pads and are available in various sizes. 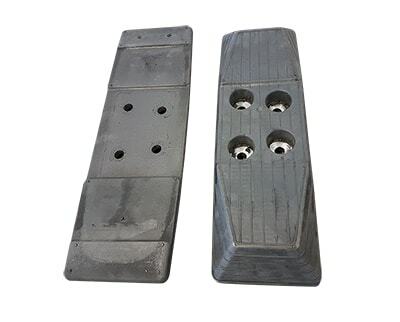 Please have available for us the width of the steel Track Pad and bolt hole spacings as shown here. 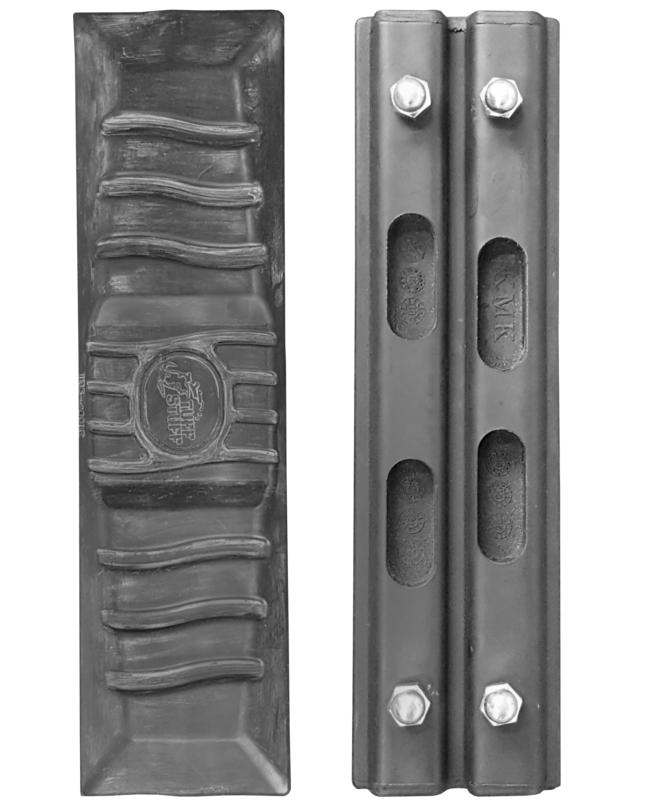 These pads are different from other types in that they are bolted directly on to the Track chain using track bolts in the same way that a steel track would be. Clip-on type Rubber pads are available for use when you do not have pre-drilled bolt holes in your steel pads. These versatile pads are available for a wide range of different machines. Our rubber pads are all built from premium materials. In terms of durability and quality, no cost is spared. Our aim with our product selection is to give customers the best value for money: the right balance of price and quality. 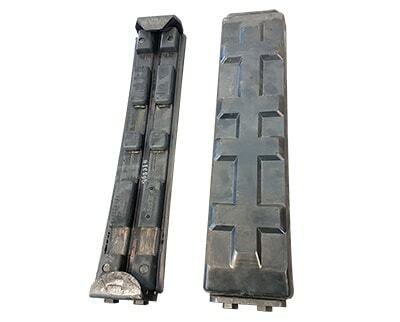 While there are cheaper alternatives, the manufacturing quality and the reliability of our excavator track pads far outweigh the cost. Our rubber pad options are also complimented by a comprehensive range of rubber tracks. 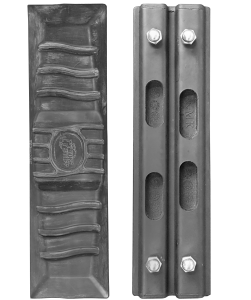 For Bolt-On pads please have available the dimensions shown in Fig.C and for City Pads (Chain) the ones shown in Fig.D below. For Clip On Pads please have available the dimensions A,B,C & D as shown in the Fig.A drawing.